Starting their career together in the late 1920s and lasting through the mid-1940s, Stan Laurel and Oliver Hardy starred in 107 pictures together as a team that began during the silent era of films and continued throughout integration of sound into cinema. Stan Laurel, the brains behind most of the duo’s material, played the clumsy and innocent fool to the pompous persona of Oliver Hardy. Together they would be considered one of, if not the greatest comedic duo in film history. Director Jon S. Baird’s touching tribute to the comedic icons follows the duo in the twilight of their careers as they tour Great Britain and Ireland for the last time before retiring; “Stan and Ollie” presents us with an older version of Laurel and Hardy as they try desperately to remain relevant in a world that is quickly forgetting them. As the pair struggle to fill small venues, they also fight emotional and physical battles with themselves and each other. Laurel struggles both with his attempts to keep the duo relevant as he also tries to forgive Hardy for starring in a film without him. Meanwhile, Hardy battles with himself, as his failing health makes it near impossible to continue the tour. 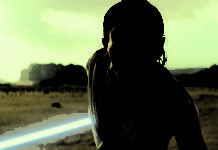 As a result of these conflicts, the film has several emotional moments where you’ll find yourself feeling genuine concern for our duo as they suffer through old age and dwindling fame. That being said, for every tear jerking moment there are several light-hearted and genuinely funny scenes where the duo’s relationship and rapport bring a smile to your face. “Stan and Ollie” is filled with brilliant performances from each cast member. 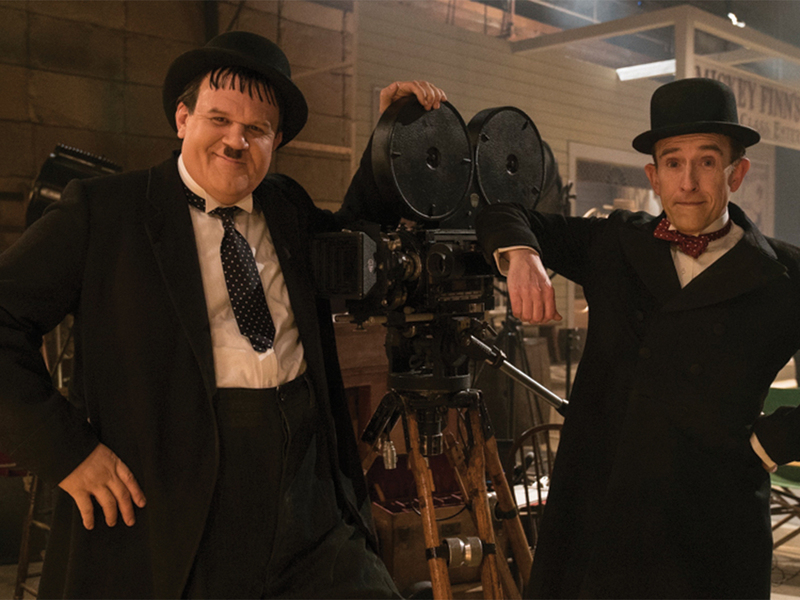 The two stars, Steve Coogan (Stan Laurel) and John C. Reilly (Oliver Hardy) are brilliant as they recreate both comedy legends as well as their iconic material. Coogan masterfully portrays Laurel’s character, down to his distinctive trans-Atlantic accent. As Laurel, Coogan takes us behind the scenes as we see the genius behind the material and witness Stan Laurel’s devotion to perpetually creating content for himself and Hardy. John C. Reilly likewise manages to portray the straight man of the duo, Oliver Hardy. 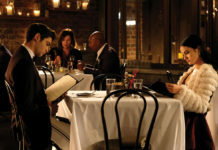 Done completely in a fat suit, Reilly delivers on portraying Hardy as the sympathetic and lovable actor who struggles both with his weight and a gambling problem. Both of the leads in this film fully immerse themselves into their roles as the audience fully embraces them as Laurel and Hardy. This is never more evident then when the two masterfully recreate the comedy duo’s massive repertoire of classic material. Likewise, the supporting cast also shine even as the two leads steal the spotlight. The wives of the two performers, played by Shirley Henderson and Nina Arianda, are shown to be the method of support for the two performers as they care for their husbands’ health and wellbeing while attending their performances as well. Even more remarkable, however, is that despite the leads being the professional comedians, some of the biggest laughs in the film come from the wives themselves as they passive-aggressively antagonize each other and stop their husbands from smoking or drinking. Even the role of the producer and manager of the tour, played by Rufus Jones, manages to steal some laughs as he is initially more interested in managing the career of an up-and-coming star rather than attending to the needs of Laurel and Hardy. All in all, “Stan and Ollie” pays touching tribute to two legends who helped kickstart the comedy film industry and influenced countless comedians that came after them. The film manages to captivate the audience as we follow these two beloved characters as they come to terms with their fading careers, and truly shines as we celebrate with them as they manage to make packed theaters laugh as they perform on stage. There are several moments in this film that will make the audience laugh and cry, but none more than the heartfelt ending as we witness the duo dance on stage for the last time in their legendary careers. Verdict: “Stan and Ollie” brilliantly pays tribute to the comedic icons that inspired countless comedic acts after them. Outstanding performances all around and a touching script deliver on an emotional and heartfelt journey through the twilight years of these legends of the industry.